This method was suggested by Ross Willians from Australia, in 2006. Consists of observing the exact sunrise and sunset times. including the running fix (i.e. considering boat movement during the day). in the morning is a greenish light, the first direct sun ray, refracted in the atmosphere. The same happens at sunset: the last flash of sun light is a similar greenish ray. Those are sunset and sunrise times. I suppose it works better on winter time, as on summer time both lines can be nearly parallel. Bad for latitude determination. Not sure. I have been unable to locate Mr Willians since, due to lost emails. I found the stars are much more convenient to give a fix. On watch during the night .there is plenty of time to identify the stars about to set in the west. (With Navigator it is now easy ). Just note the time and correct for refraction ( temperature and pressure corrections ! ) and eye height as usual. 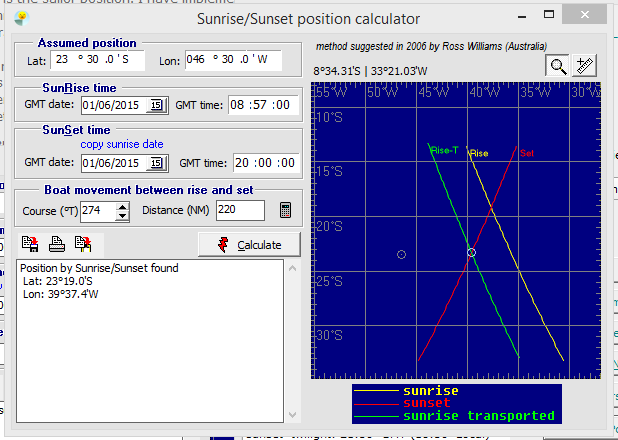 The sun run method will give an unknown error of at least a few miles.The only time the position lines will be parallel is at the Equinox,and the best crossing angles at the shortest and longest days.